AMCAT Stacks and Queues Questions-Computer Programming section 2018: AMCAT is one of the topmost employment tests. The level of the questions is also average.That makes it easy to score more in the test. The exam majorly comprises of 3 modules – Quantitative abilities, Reasoning abilities and English language. It also includes personality test. Computer programming section is one of the optional modules. This module also helps attracting more recruiters to the profile. Note: All the aspirants preparing for amcat exams should practice topic wise questions for better score in the real exam. 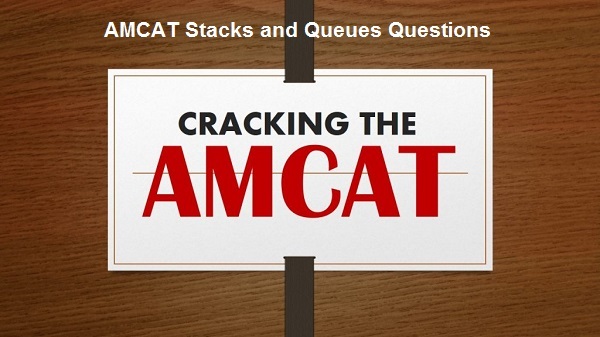 One of the important topics in AMCAT Computer Programming section is stacks and queues. Most of all 1-2 question comes every time. In addition, the difficulty level of the questions is moderate. It usually takes 45- 50 seconds to solve the questions. Below we will be discussing in detail about stacks and queues and its sample questions. Queues and stacks is a rather, important concept of data structures and algorithms. Stacks are dynamic data structures that follow the Last In First Out (LIFO) principle. The last item to be inserted into a stack is the first one to be deleted from it. For example, you have a stack of trays on a table. The tray at the top of the stack is the first item to be moved if you require a tray from that stack. In data structures, stacks have restrictions on the insertion and deletion of elements. Elements can be inserted or deleted only from one end of the stack i.e. from the toptop. The element at the top is called the toptop element. The operations of inserting and deleting elements are called push()push() and pop()pop() respectively. When the top element of a stack is deleted, if the stack remains non-empty, then the element just below the previous top element becomes the new top element of the stack. As an example, in the stack of trays, if you take the tray on the top and do not replace it, then the second tray automatically becomes the top element (tray) of that stack. Size of stack changes with each push()push() and pop()pop() operation. Each push()push() and pop()pop() operation increases and decreases the size of the stack by 11, respectively. Like Stack, Queue is a linear structure which follows a particular order in which the operations are performed. The order is First In First Out (FIFO). A good example of queue is any queue of consumers for a resource where the consumer that came first is served first. Enqueue: Adds an item to the queue. If the queue is full, then it is said to be an Overflow condition. Dequeue: Removes an item from the queue. The items are popped in the same order in which they are pushed. If the queue is empty, then it is said to be an Underflow condition. Front: Get the front item from queue. Rear: Get the last item from queue. Which one of the following is an application of Queue Data Structure? A. When a resource is shared among multiple consumers. How many stacks are needed to implement a queue. Consider the situation where no other data structure like arrays, linked list is available to you. A priority queue can efficiently implemented using which of the following data structures? Assume that the number of insert and peek (operation to see the current highest priority item) and extraction (remove the highest priority item) operations are almost same. In a queue, the initial values of front pointer f rare pointer r should be …….. and ……….. respectively. Which of the following is true about linked list implementation of queue? In a push operation, if new nodes are inserted at the beginning of linked list, then in pop operation, nodes must be removed from end. In push operation, if new nodes are inserted at the end, then in pop operation, nodes must be removed from the beginning. You can also practice sample questions on AMCAT iteration, recursion and decision. 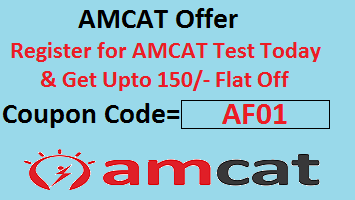 Any questions and concern on AMCAT Stacks and Queues Questions then please ask in comment box.